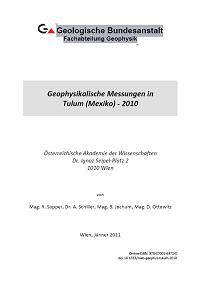 This report contains the results from the 2010 measuring campaign in the area of Tulum (Yucatan, Mexico), carried out within the international research initiative XPLORE, devoted to the protection of the Sian Ka'an biosphere reserve. The field work, co-financed by the Austrian Academy of Science in frame of the Man and Biosphere (MAB) program and the project Xplore (L524-N10) of the Austrian Science Fund, was performed between April 6th and 24th, 2010. It was the sixth measuring campaign since 2006, with the goal to advance the general understanding of the whole karst system in the area by application of airborne and ground geophysical methods. The main focus for this campaign was put on drilling and borehole measurements to investigate key parameter of the limestone rocks for calibration of the airborne results and the follow up groundwater model. They should provide high resolution data of the subsurface in the surrounding of cave systems. For this purpose several measuring methods were applied including electromagnetics, natural gamma, flow measurements (Impeller Flow meter), temperature, electrical conductivity and HiRAT (High Resolution Acoustic Televiewer). Borehole logging was performed in total at 9 boreholes from which 7 were drilled during the first two weeks of the field campaign. The interpretation of the collected data leads to the important conclusion that the porosity of the formation has an unexpected strong influence on the measured resistivity compared to the influence of pore fluid conductivity. This is demonstrated by the fact that we observed similar resistivity values in the freshwater and saltwater saturated formations, depending on their porosities. In addition important data related to cave and fissure structures which were drilled trough were derived. In addition to these measurements several geoelectrical measurements were performed close to the drill holes. At some locations geoelectric borehole to surface measurements were additionally performed to increase the resolution of the derived model. With the aid of a special borehole water sampling device about 15 water samples were collected inside the boreholes at different depth. These water samples were filtered and stabilized in the field and finally analysed by the Department of Geochemistry of the Geological Survey of Austria in Vienna. The results show that the so called "freshwater" in the research area is always influenced by seawater. The degree of influence depends on the distance to the sea and the depth where the water sample is taken. The mineral content (Ca2+, Mg2+ and K+) of the analysed water samples is high due to the influence of seawater and limestone. To the end of the measuring campaign, when all the work and measurements related to the boreholes were completed, combined temperature/pressure sensors were installed at six selected borehole locations to monitor the variation of the groundwater level over a period of one year. This long term data is essential for the calibration of the hydrological modelling, since so far hardly any long term data is available. The analysis and interpretation of this data will be finalised after collection of the sensors in February 2011.